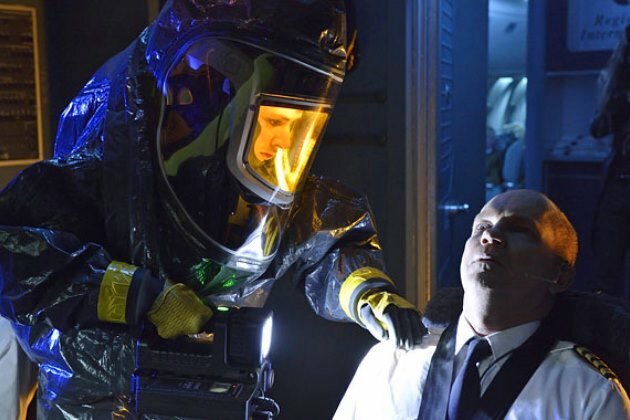 On Sunday, July 13 FX premieres “Night Zero” the first episode of the new series The Strain based on the novel trilogy by Guillermo del Toro and Chuck Hogan. By the time you read this, it may have already aired. Either way, let us assume you haven’t yet seen it nor read any of the books upon which it is based. A few spoilers do follow. But only a few. What is it all about? In essence, it tells of a virulent vampire outbreak in New York City, with more than a few echoes of Bram Stoker‘s Dracula as well as a bit of Stephen King’s The Stand. The episode’s title refers to a countdown, beginning pretty much with a modern version of a scene from many a film version of Stoker’s famous book A Boeing 777 lands at JFK airport and suddenly goes silent. Everything on board shuts off. No radio. The engines wind down. Not a single passenger uses their cell phone to call for help. But in the teaser, we see a tiny bit of what happened aboard the plane. Just a tiny bit, not enough to really answer any questions. Of course we the audience know something happened and most likely something unhuman did whatever-it-was. The tension arises from watching characters figure that out, then slowly learning the details to their ever-increasing horror. At this point, most horror dissolves into formula and mediocre acting. Not so The Strain, happily! For one thing, the vampires (and of course, given the location of this review we all know the horror is vampires) prove unique. Going into too much detail would distract rather than help, but suffice to say these things make the creatures in 30 Days of Night look like the Cullen clan in Twilight. Imagine bipedal leeches and you’ll start to get an idea of their sheer awfulness. Intelligent leeches. With superpowers. And (eventually) hardly a trace of their former selves left once their central nervous system along with everything else undergoes a full metamorphosis. But good horror requires more than good monsters. We need characters as well, and the more real such seem, the more involved we become, the more invested we end up in their fate. High on the list of regulars is Dr. Ephraim Goodweather, the man called upon to investigate what happened to the plane and its passengers. Played by Corey Stoll (best known for House of Cards), ‘Eph’ as he’s known, avoids the dreadful cookie-cutter nature of leading characters in far too many films and television. For the purposes of plot, he needs both brilliance at his job as well as fierce dedication to protecting the public. We see this translates into what we’d expect in such a person in real life. Arrogance. Myopia. A hard-edged charisma coupled with self-righteousness, who’s also taken some serious blows. His marriage on the rocks, he’s played fast and loose with the legal system to try and retain custody of his son. It didn’t work. Yet for all that he’s a good man, one with some real (albeit very reluctant) awareness this mess is one of his own making. Virtually in orbit around Eph at the CDC (Center for Disease Control) is Dr. Nora Martinez (Mia Maestro, a veteran of the tv show Alias as well as having had a small role in the last two Twilight films). She functions as Eph’s Watson to his Sherlock, an extremely talented person in her own right but eclipsed by his problematical genius. Less ruthless, more grounded, quite a bit more flexible her role seems one of those destined to grow as the series progresses. 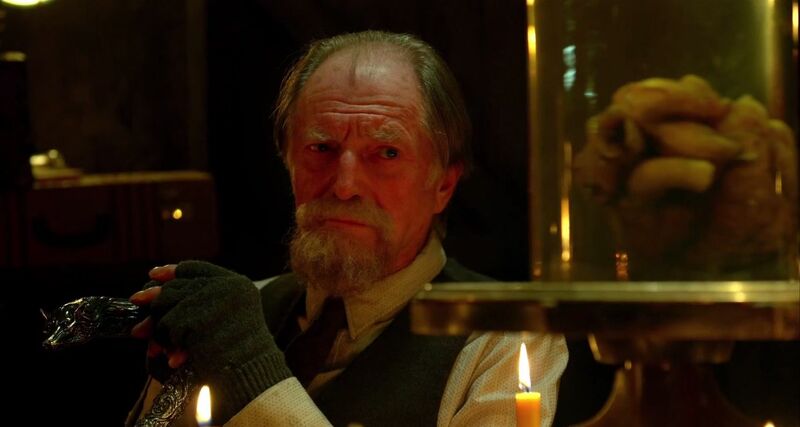 As far as our heroes go, the opening episode also introduces us to Abraham Setrakian (David Bradley–veteran of Harry Potter and The Game of Thrones, who got to play William Hartnell in last year’s An Adventure in Time and Space), a Holocaust survivor and veteran hunter of vampires–wily and tough and maybe ruthless enough to be a little mad. He may suggest Van Helsing, but a far crankier and less patient one. One immediate source of tension is the question of when and how he’ll meet up with Nora and Eph, who of course have zero reason to believe one word out of his mouth. Opposing them is more than biological unhumans seeking to devour humanity. Behind much of the struggles our heroes face is someone as human as can be–and just about as horrible as members of that species can be without the excuse of needing human blood to survive. Dying millionaire Eldritch Palmer (love these names!) has an agenda with no real empathy or pity, nor room for same. 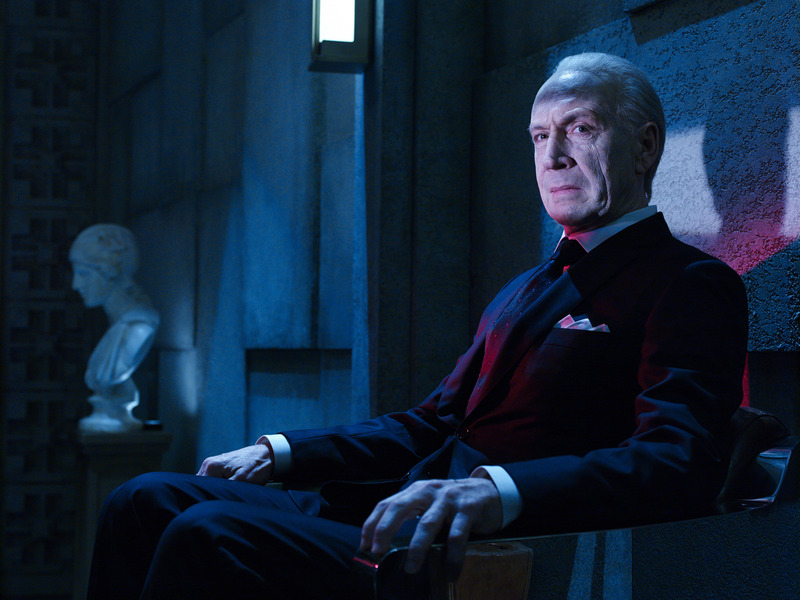 Played by Jonathan Hyde (of Jumanji and Titanic fame), he embodies the archetype of the kingmaker behind the scenes, yet still comes across as person rather than a stereotype. Getting a first rate cast does that. Having read all three books I know other characters are on their way, with twists horrific as well as amazing en route. One thing this opening episode conveys–a vital point for the entire feel of the story–is that this world remains unsafe. The Count from Transylvania may be doomed to failure. This time, we aren’t that sure. Like Game of Thrones, here we’re in a story where the good guys might fail, and even if they succeed the price mostly likely will prove terrible beyond words. We see so much of New York even in this single episode. Impressively, it and everyone we see feel at risk for much worse than simple death. If The Strain continues in this vein (sorry) we have quite an intense ride ahead of us! The Strain is going to be good. I like the way they sneak the Vampires in on the city, this is awesome!